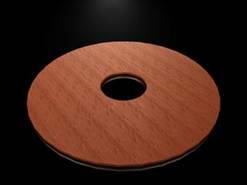 Oil-impregnated bushings can also be washer-like devices that allow you to create a lubricated surface between two metal surfaces. They are generally used in a low-speed environment, i.e. 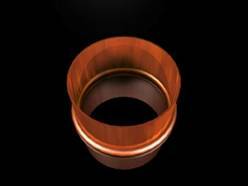 you would not want to use these bushings as a bearing in a fast-turning object. 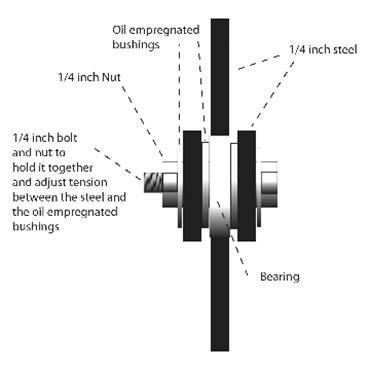 Below is an example drawing of oil-impregnated bushings used with metal surfaces. Standby Deliver consists of steel plates attached to activating motors that face each other and move back and forth. Underneath is a lit glass sugar molecule. 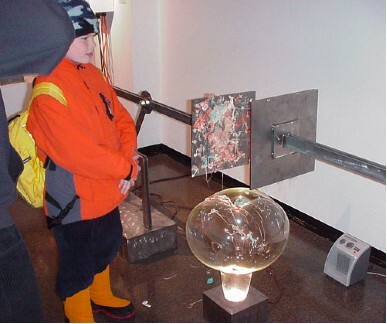 Visitors have access to chewing gum that they can chew and stick to the plates, which will stretch out long colorful strings of the sticky substance. 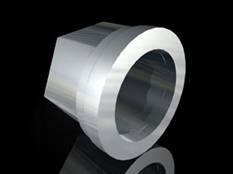 The round junctions where each of the mechanisms meet have a bearing and oil-impregnated bushing to help reduce wear and tear over time. 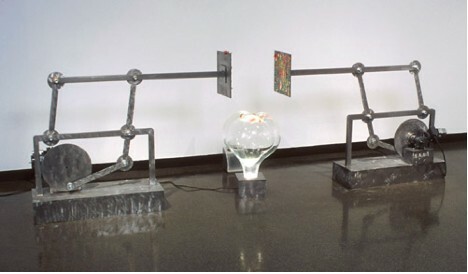 Standby Deliver by Ken Rinaldo, 2000. After many cycles of the plates’ back and forth motion, the glass sugar molecule is coated with the colorful goo. 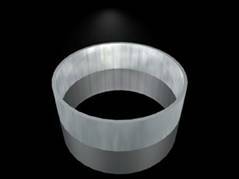 Look for bearings and bushings from these and other online sources and catalogues: Canadian Bearings Ltd. at http://www.canadianbearings.com/ Go Kart Supply at http://www.gokartsupply.com/ and Mendelsons Liquidation Outlet at http://www.mendelsonelectronics.com/ . Universal joints are used to transfer a circular motion in one plane to a circular motion in another plane.